If you’ve been watching the news, you’ve probably heard a lot about the dispute between Ukraine and Russia for control of the Crimean peninsula in the Black Sea. Amongst the political upheaval, stories of alleged corruption are being unearthed, including a revelation that involves the phantom firms we’re currently campaigning against. 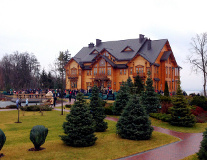 Recently ousted President Yanukovych enjoyed an opulent lifestyle at his private estate of Mezhygirya. Now, Ukranian investigative journalists have revealed a shady ownership structure of the palace compound that involved phantom firms based in the UK – anonymous shell companies that hide the real identity of the owner. Just like in many developing countries, these legal loopholes allow corrupt politicians and dodgy businesses to siphon off assets worth billions into international bank accounts, cleaning up the money in the process. For more details of the ownership of the Mezhygirya compund, check out the chain of evidence compiled by Global Witness. The current laws which allow owners of companies and trusts to hide their identity, makes tracking down illicit financial flows almost impossible. Nearly a week after Yanukovych was ousted by Parliament, Switzerland, Austria and Liechtenstein froze the assets of 20 Ukrainians, including those belonging to Yanukovych and his son. The EU followed suit, freezing the assets of 18 senior Ukrainian officials on 6 March, 12 days after Yanukovych was removed from power, and allowing plenty of time for funds to be transferred. Ukraine’s new Prime Minister Arseny Yatseniuk accused the former President of embezzling as much as $37 billion during three years in office. All of this begs the question – why did banks accept billions of dollars of funds embezzled from the Ukrainian state in the first place? Anti-money laundering laws require banks to check out their customers and their assets. Unfortunately, it’s relatively easy for corrupt politicians to access the financial system, and it’s easy for banks to turn a blind eye and accept funds. As the crisis in Ukraine continued to unfold, economic sanctions were imposed by the United States, which froze the US assets of seven Russian government officials and banned them from doing business with American companies. However, the US did not target Russian President Putin, whose fortune of an estimated $70 billion is reportedly hidden in opaque corporate structures. While phantom firms exist, it will remain impossible for the US to know if Putin has holdings in the country, or to control his access to them. We have repeatedly seen leaders use the secrecy provided by phantom firms to hide illicit funds from the law, including in Libya, DRC, Equatorial Guinea, and the Philippines. This is why we’re campaigning for the European Union to pass legislation which makes information about who companies and trusts public. Join over 60,000 ONE members calling for change and sign the petition now.